Time is a fickle creature, especially when there's wormhole in the science cupboard. When a strange boy who seems far too entranced by cell phones appears, it's up to Lottie, Shauna, and Mildred to figure out his strange purposes. 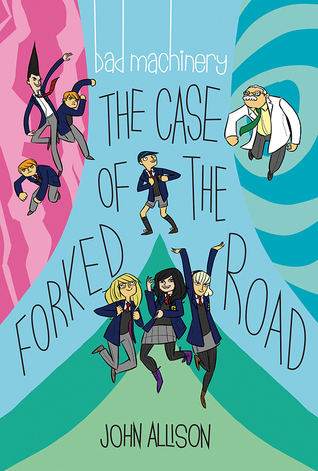 The Case of the Forked Road, the seventh book in John Allison's award-winning Bad Machinery series, finds our young sleuths facing the intricacies of time and space itself. What is their science teacher hiding? Who is the mysterious Calvin, why is he dressed like it s 1960, and why is he obsessed with Communists? And another thing: just what is going on with Jack, Sonny, and Linton?" This was amazing! It's weird and wonderful and I just have to keep reading these! These are great for all kids both boys and girls and I think that those in high elementary school, as well as middle school, would enjoy these. If you love time travel and you want a good read to pick this one up!